Villa Elif is a brand new ultra luxury and modern villa which has just been completed in 2018. The impressive architecture will immediately catch your attention, with its unique design and high class furnishings. There are 3 bedrooms, two of which have Jacuzzis incorporated into the bedroom, whilst the third bedroom has a separate en-suite bathroom. It is located in the heart of Ovacık, just a very short walk off the main road where you will find a large choice of restaurants and shops, as well as the main bus route between Oludeniz beach and Fethiye town. Despite it’s close proximity to all the action, it remains nestled in a quiet area, surrounded trees and flowers, and is also completely private so the grounds of the property cannot be overlooked at all. Each aspect of this villa has been given complete attention to detail to ensure guests have absolute luxury. 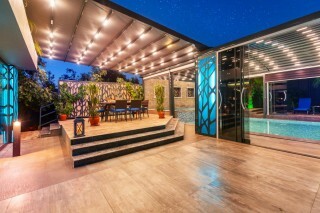 The outside are comes complete with a sheltered pool which can be open or closed, perfect for summer or winter rentals in which the pool can also be heated. You will also find and a pool table for your entertainment. Bedroom 1: Master bedroom, round double bed, LCD TV, dressing table, wardrobe with safe, Jacuzzi and en-suite. Bedroom 2: Double bed, LCD TV, dressing table, wardrobe, Jacuzzi and en-suite. Bedroom 3: Twin beds, dressing table, wardrobe, and en-suite. Living Room: Spacious open-plan living area, with stylish sofa, LCD TV and satellite, water feature, dining area with high chair, kitchen area and WC. Access to pool area. Kitchen: Ultra modern kitchen with a tasteful design and high quality appliances. Outside: Large swimming pool which can open or closed to make either an indoor or outdoor pool, as well as smaller, shallower pool/jacuzzi. Pool dimensions: 9 x 5m, depth 1.4m, small pool: 5m x 2m, depth 1m. 4 x Sunloungers, garden swing, hammock, pool table, outdoor dining area, BBQ, outdoor seating area and coffee table. Note: Pool can be heated with extra 150 GBP. The maximum temperature it can reach is 28 C.
Cleaning / Towels / Linen / Maid-service: Bathroom towels and bed linen included. If you are staying for more than one week then the villa will be cleaned and linen changed. If you require extra cleans and linen changes then these can be arranged at a fee. Damage Deposit: an accidental damage deposit is required when you arrive, which will be returned to you at the end of your stay if everything is in order. If anything is broken or damaged we will deduct the cost of repair/replacement from your returned deposit. For early check-in or late check-out an extra night will need to be booked. Note: £150 per week for pool heating, and this must be requested at the time of booking. August 10th - 17th 2019 is Bayram/Eid and prices for this week are £2800. 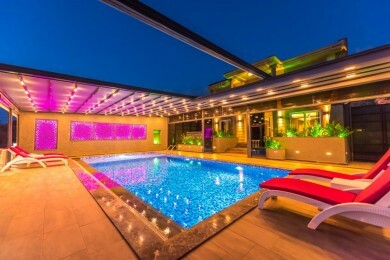 An ultra luxury and modern villa in Ovacik with secluded swimming pool, convertible to indoor or outdoor pool. Sleeps 6 people.